Show off with your name and year personalized on an amber growler and four 6.75 oz glasses. 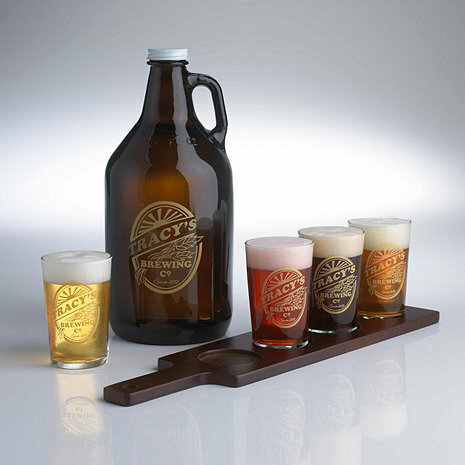 Bring that brewmaster touch to your home with the Personalized Brewing co Beer Flight Glasses. Serve your favorite beers just like the Beermasters at your next gathering. Show off with your name and year personalized on an amber growler and four 6.75 oz glasses. Plus present the flavors on a rustic stained wooden paddle, with an inset for each glass. BEST ANSWER: Yes, but make sure they don't clang against other items. They are delicate. Hand wash is recommended due to the decals personalization on this. Can you have the personalized growler and flight set have a specific design etched onto it? Or does it have to be the design you have already on it? BEST ANSWER: The design will be the same, there are no options for that. My husband makes his own beer and I thought this would complete his brewery. At first I was disappointed as I thought the glasses were going to be pint size, but then realized there are people who like to just take a small "taste" of his beer and these glasses would be perfect for the small taster.